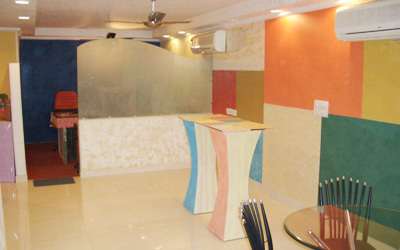 Welcome to the world of Designer Texture Finishes Wall Art has excellent range of designer texture finishes. These amazing texture finishes can be used to decorate homes,villas,farmhouses,office space,hotels,farmhouses,corporate houses etc. The decorative finishes are available in huge variations to convert your walls into a piece of art. International Brands of Architectural Coatings, Paints,Decorative Texture Paints,Designer Wallpapers, Wall coverings and 3 D Panels. Huge range of Architectural Coatings, Decorative Textures, Green Paints, Wallpapers, Wall coverings, 3D Panels, Gold Leafing / Silver Leafing, customized wall papers. Italian texture paints have very vast range of interior & exterior finishes such as Antico ferro, Ardesia, Aurem, Stucco, Imperium, Multidecor, Ottocento, Mother of perl, Keros, Drape, Marmarino, Novalis, Travertino, Archital, Decorsil & veldecor ect to convert the walls into a piece of art. Please fill up the form we will get back to you soon. Antico Ferro is a decorative solution for interiors that allows you to give your walls the charming aesthetic effects of seasoned iron. The corten, Battuto,Ruggine and Ossidato finishes reproduce a significant number of the effects that are to be found in nature, without affecting nature itself. Ardesia by Italian is a decorative solution with a Low Environmental Impact that reproduces the texture and colour of slate. This material boasts the texture and feel that is continually sought after by interior designers due to its ability to bring quality. Aureum by Italian is a decorative finish with a golden tone created using lime putty and golden powders with a low environmental impact. The shades of AUREUM derive from the colours of the earth and the warm tones of nature; combining elements from specific historical research with a deep understanding of contemporary technology has made it possible to give rise to a product with regal, golden properties that adapt themselves to both modern and traditional settings. Raffaello Décor Stucco by Italian is a vapour permeable wall coating based on lime putty, and is ideal for recreating an ancient style of decoration, the so called "marble effect". The use of RAFFAELLO DÉCOR STUCCO by Italian guarantees maximum vapour permeability and aids the natural diffusion of humidity through the wall, therefore avoiding the formation, over time, of mould and bacteria. Imperium by Italian is a metallic, decorative finish for interiors with a low environmental impact.The product allows the realisation of splendid decorative effects in a vast range of shades according to the type of tool used in application. Multidecor by Italian offers the possibility to decorate in a classical style or according to the more modern, vivid interior decorations of today. A trowel, a cloth, a buffer pad, a spray gun, the imagination of a designer and the versatility of this product allow the expert hand of the applicator to create a unique, decorative effect that can be adapted to suit the environment to be decorated. Ottocento is a vapour permeable coating, that due to its formulation based on resins in water dispersion and special metallic pigments, makes it possible to obtain unique decorative finishes. The principle characteristic of Ottocento is that of reproducing, according to the reflection of light, an effect similar to that of velvet. Raffaello Madreperlato is a sort after finish based on lime putty and a special pearlescent pigments that is used as a finish on Raffaello Decor Stucco, after application the green and gold metallic pearl reflections add a touch of prestige to any enviroment. Kreos, in the Fil Posé finish, is a highly decorative texture finish for interiors. It is formulated in a smooth, light paste that is easy to work with and that creates precious,intense and highly resistant surfaces.with and that creates precious, intense and highly resistant surfaces. Marmarino Naturale by Italian is a decorative, vapour permeable, coloured lime putty coating for interior and exterior. 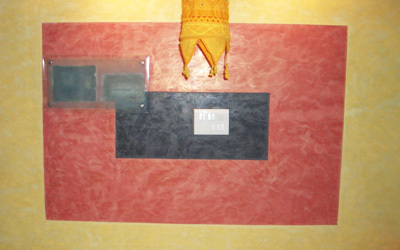 The product allows to achieve easily and quickly to beautiful decorative effects known as “marmorino”. The thickess of Marmarino Naturale allow to decorate and to hide small imperfections of the wall at once, thus saving on expensive screedings. Novalis by Italian is a special, low environmental impact, , ideal for use on non porous substrates on which products have problems of adhesion, such as; zinc sheets, plastic laminates, aluminium The product is paintable with enamels and other decorative products. Travertino Romano travertine was formed in an ancient warm spring. Calcium carbonate from the mineral water crystallized and formed the beautiful and distinctive Travertino Romano travertine. Pure calcium carbonate crystals are white and the coloration in the travertine comes from other minerals. Ultrasaten is a water based, acrylic enamel for walls, that comes in a gloss, matt or satin finish. The product is self-expanding, scratch resistant and resistant to abrasion. Easy to clean and wash, it is ideal for public premises such as schools, hospitals, offices etc. Archital by Italian is a special, highly washable, anti mould, water based, acrylic paint for exteriors.The product’s formulation combines the durability and resistance of quartz with the special qualities of acrylic resins such as, good strength. Decorsil / firenze by Italian is a water repellent, vapour permable coating that offers outstanding resistance. Formulated with quartz powder with a maximum grain size of 0.3 mm, It allows the realisation of the: cloud effect, antique effect, orange peel effect. Veldecor by Italian is a semi-hiding siloxanic paint, conceived to achieve decorative glazing for exterior and interior walls. Working the product by using the brush, glove or sea sponge by Italian, it is possible to achieve prestigious aesthetic finishes that recreate the effect of ancient plasters.